The DSP9P pistol is produced in the Republic of Korea by Dasan Machineries Co and is offered for export sales. By design Dasan DSP9P pistol appears to be a clone of the famous Austrian-made Glock 19 pistol, with major differences being its frame design. While Glock pistols feature completely plastic frame with small steel inserts, Dasan DSP9P features upper part of the frame (which hosts trigger unit and slide rail) made from aluminum alloy. The grip and trigger guard are made from plastic and are removably attached to the upper, metallic part of the frame. Slide is made from stainless steel. As a result, this pistol is somewhat heavier than its Austrian prototype. 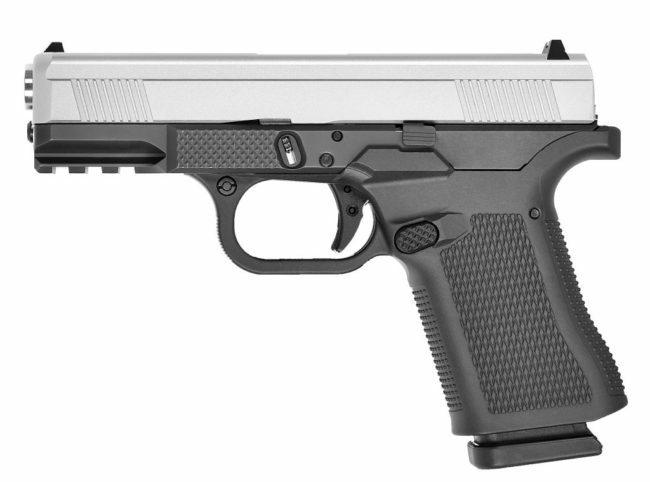 Dasan DSP9P pistol is short recoil operated, semi-automatic handgun that uses Browning-type locking with vertically tilting barrel, controlled by a cam below its chamber. Barrel locks to the slide by a large lug that enters ejection window. Trigger is striker-fired, with partial cocking of the main spring achieved during the reloading cycle and final cocking and release achieved only through complete pull of the trigger. Gun has no manual safeties, and an automated safety is provided on the trigger. 15-round magazines are compatible with 9mm Glock 19 pistols.